The police storm into the Sorbonne to break up a rally and proceed to arrest many of the participants. A spontaneous protest that immediately breaks out in the Latin Quarter is brutally suppressed. The students protest for 13 hours, demanding the release of their student and worker comrades. The police charge: 800 are wounded. 50,000 students and workers march for 20km through Paris demanding the satisfaction of 3 preconditions before any discussion and again clash with the police who attack violently even though the protest had already peacefully dispersed. 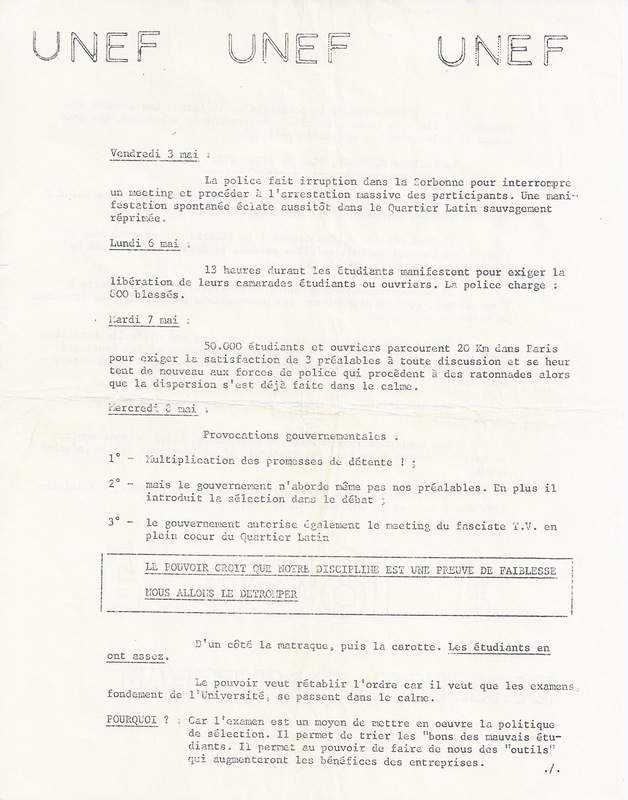 3rd – the government also permit a rally of the fascist T.V. group to be held right in the middle of the Latin Quarter. On one hand the truncheon, then the carrot. The students have had enough. The state want to restore order because they want the examinations, the basis of the University, to take place peacefully. WHY ? :	Because the exam is a way of applying the politics of selection. It allows for the separation of the “good” from the poor students. It allows the state to make us into “tools” that will increase the profits of businesses. So it’s necessary to prepare for the continuation of the struggle. The examinations are getting closer and they’re going to play their role: as the implement of selection. The students will not tolerate such a policy. THE STRUGGLE HAS BEGUN, IT WILL CONTINUE. Planning is necessary. We have to organise into U.N.E.F. fighting committees. All of these committees will consider and co-ordinate their actions. 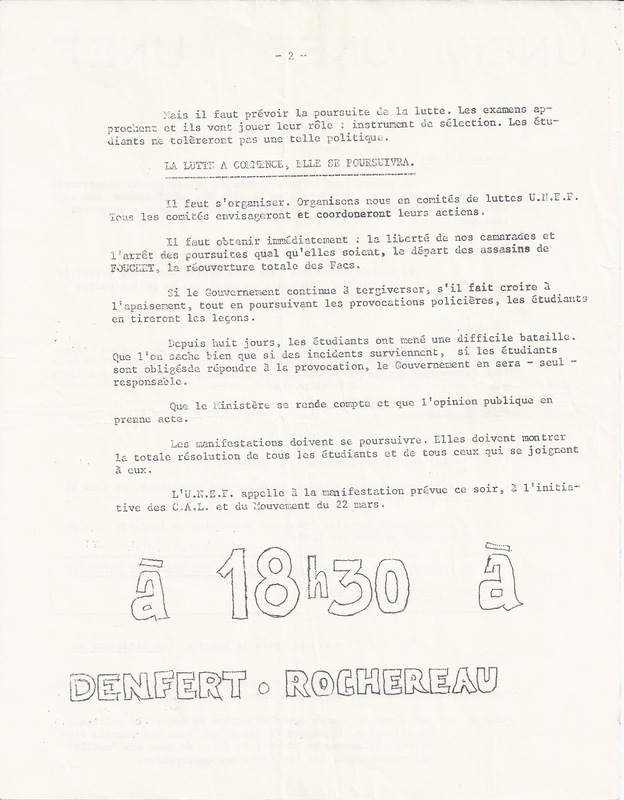 We need to immediately secure: the freedom of our comrades and the cessation of legal proceedings against them, the departure of FOUCHET’s assassins, and the full re-opening of the Faculties. If the Government continues to prevaricate, if it pretends to be calming down, while continuing the provocations of the police, the students will learn from it. For eight days the students have undertaken a difficult battle. As is well understood, if incidents occur, if the students are forced to respond to provocation, it will be the Government, alone, that is responsible. May the Minister realise this and may public opinion take note. The protests must continue. They must display total resolve to all the students and to all those who join in them. The U.N.E.F. supports the demonstration to be held tonight, at the initiative of C.A.L. and the March 22nd Movement.